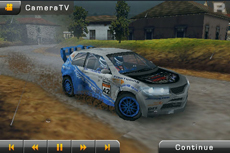 rally Master Pro is the ultimate rally experience for your mobile phone! Race in amateur, professional and expert rallies on 27 ambitious and varied tracks, in any weather, with tough conditions, at top speed.Experience how the driving behaviour changes based on the road surface, weather and condition of your vehicle and always pay attention to your co-pilot and his announcements.Keep an eye on the damage model of your car. uncompromising rally action on 27 ambitious, detailed tracks in sunshine, rain..
...... Only if you know what the road ahead looks like you will be able to drift smoothly through the curves and make it under the strict time limits. Keep an eye on the damage model of your car and use the repair option between the races to get your vehicle fixed for the next race or you won't get far. A unique all-in-one desktop software for a stock photo contributor. Qweas is providing links to Rally Master Pro for Mobile 1.1.0 as a courtesy, and makes no representations regarding Rally Master Pro for Mobile or any other applications or any information related thereto. Any questions, complaints or claims regarding this application Rally Master Pro for Mobile 1.1.0 must be directed to the appropriate software vendor. You may click the publisher link of Rally Master Pro for Mobile on the top of this page to get more details about the vendor.